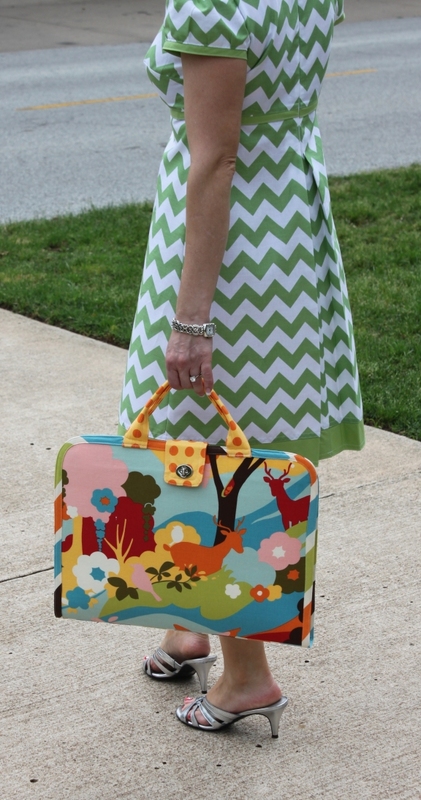 Here is the final reveal of the spring collection, Artful Bags & Accessories! This collection of designs will be contained in a small booklet, 8.5 x 5.5 and 24 pages. There are no pattern pieces, as all of the components are cut using your rotary cutter, ruler, & mat. These are perfect for the crafty adult or creative kid. 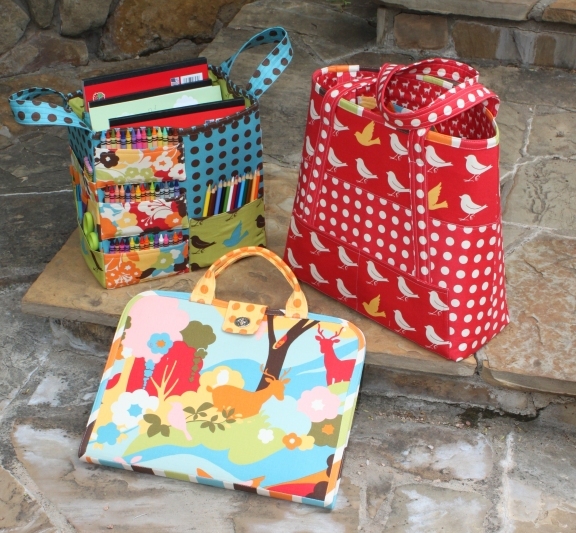 All of these designs were sewn up using a new line of fabric from Moda called Oh Deer! by Momo. It will be available in shops nationwide in the coming weeks. First up is the Artist Portfolio. This one is really easy to put together and is perfect for showcasing a large scale fabric. I love the vinyl pocket on the interior because not only can you see your supplies at a glance, but your fabric choice shines through as well. This piece holds an ample amount of supplies as well as up to a 100 page sketch pad, 11 x 14 in size. With the convenient handles, it is a cinch to fold up and carry with you. Just think how great this would be for the artist on the go or that creative young one who likes to travel with drawing supplies! Next is the Crafty Carry-All. This is a nice size (not too small or large) tote bag that has lots of room to hold all sorts of supplies. There are interior and exterior pockets as well as an interior loop to hook your keys to. It is constructed with Peltex, so it stands well on its own. 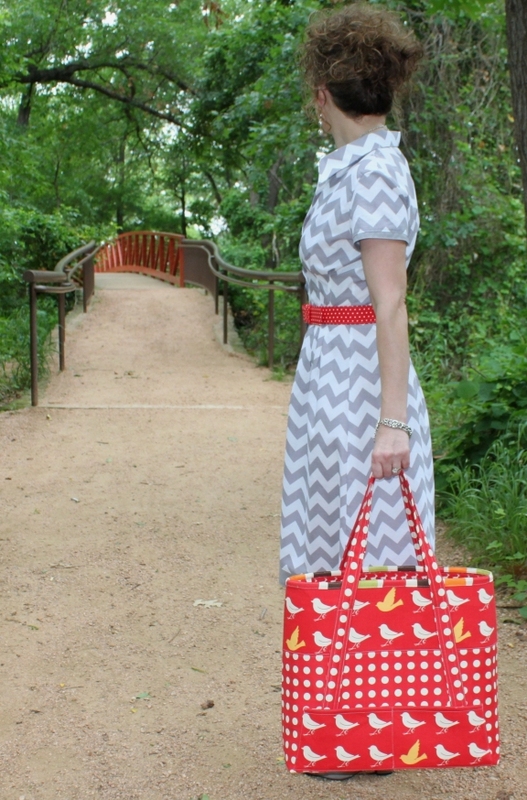 This is the perfect tote for running errands or going to a crafty workshop. The straps are attached all along the bottom and sides of the bag, making it extra sturdy. The trapezoid shape makes it just a bit narrower at the top than the base so it is comfortable to carry over the shoulder. Last is the Arts & Crafts Caddy. 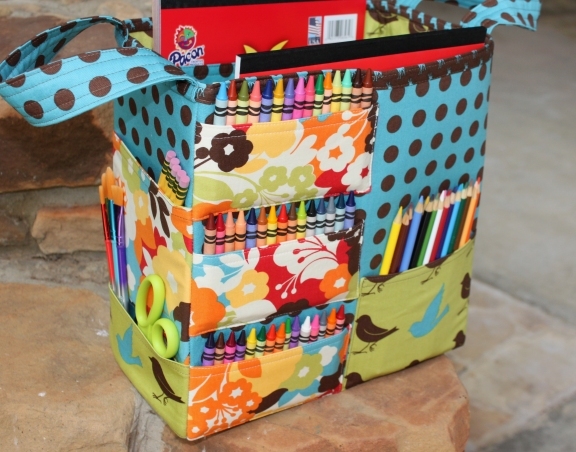 This one is loaded with pockets for all sorts of creative supplies like crayons, colored pencils, markers, pencils, brushes, paints, etc. There are two large interior pockets that are perfectly sized for 9 x 12 drawing pads, leaving the inside of the bag free for stashing anything else you need. This is the perfect accessory for a busy creative space as it keeps all of your drawing and painting supplies well organized without taking up a lot of room. 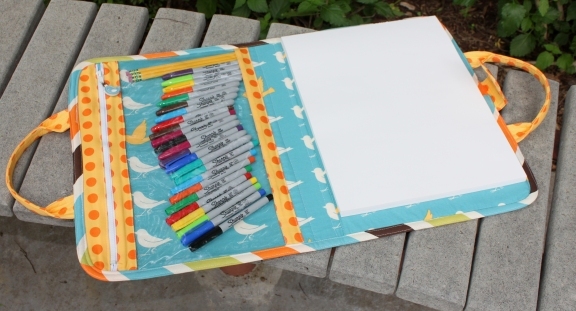 Because the handles are short and on the narrow sides, this would also be a great addition to the back seat of a car or SUV between the seats to keep art supplies organized on a long road trip! We will be listing the new patterns (ALL OF THEM!) sometime this week. We will be sure to keep you posted when that happens.